Random bullets. No, really. They're very random. Horace's post about reading as productivity was right on target. I can read and read and READ and read and take notes--but that doesn't feel as productive as writing, however necessary it may be. I am making a conscious effort to greenify, if that's a word, my daily life. I've been using my laptop instead of the big computer (it's cooler and quieter, so logic dictates that it is more energy efficient, no? ), walking most places, getting the garden planted, unplugging the toaster and other instant-on appliances, and eating more leftovers. I had converted some time ago to CF bulbs and the lovely space-alien green glow that some of them give off (PR on these says "this doesn't happen," but they haven't seen them in my light fixtures), so I can't do any more in that way except use less light. Does anyone else have a collection of small metal boxes left over from Altoids, loose tea, and spices? What on earth can you do with them? I hate to throw them away, because they look as though they'd be good for something, but they're starting to rebel and leap out of the cupboard because there are so many of them. I saw a moose the other day when I was out driving, the first one I've seen around Northern Clime. It was a young one and seemed confused by the traffic. It can be as confused as it wants to be, as long as it doesn't leap in front of my car, which isn't much bigger than it is. My mother called recently with the news that an elderly (and not close) relative had died at the age of 94. I knew her in a weddings-funerals-and-Easter-gatherings kind of way and had not seen her in some years. Still in her teens, Great-aunt X had married in the depths of the Depression and had gone to live on her new husband's family farm, where the household included a fairly, um, exacting mother-in-law, assorted relatives, and eventually six children of her own. I can't even begin to imagine the amount of work that she had to do every day to keep everyone, including a bedridden mother-in-law, fed, clothed, and clean, let alone to do the work that women did on farms back then. She lived on the farm, by herself but with family nearby, until going into the hospital about a week before her death. She was living there last summer and, at 93, was still canning peaches, tomatoes, and sweet pickles as she had done for the last seventy years. She was the most cheerful person I have ever met. Although I don't usually talk about my family, I mention her here because for years when I've wanted to whine about how much work I have to do and how demanding people are and--well, you know how those whines go--I would think of Great-aunt X and the work she did. What it reminded me was that there's the work I do, and then there's work. Being at a conference: useful. Getting back from a conference: priceless, and worth every one of the premium chocolate-covered almonds that I scarfed down as a reward when I got home. My paper went well, as did the other obligations I had at the conference. Secret message to panelists in the session I chaired: thank you for presenting your papers in the time allotted. Secret message to people who congregate outside the open door when a session is going on: yes, we can hear you. No, we don't want to hear you; you're drowning out the panelists. Go away or shut up, please. Secret message to the person who sat behind me and coughed and coughed and choked and coughed and coughed, only to leave momentarily, return, and begin coughing again: I know you want to hear the panel, but the rest of us do, too. Please reconsider sitting in the audience instead of standing by the door. Is it a compliment to hear someone praise a point you made in the previous session if that person announces the point as though it has just struck him at a new idea? Is there such a thing as oral plagiarism? Did you ever noticed that for some people you see at conferences, you only have about 5 minutes' worth of conversation and after that you don't have much to say, even if you like them? The best part: taking a long walk through the city in absolutely perfect weather, seeing all the signs in a language that I couldn't read, smelling the fresh and dried fruits that I couldn't identify, and watching the people going about their daily lives because it's not Fabulous City to them; it's just home. I haven't dropped off the face of the earth; I've just been in conference world, a rewarding place in many ways but also a busy and tiring one. They could have held it in my back yard for all that I've seen so far of the Fabulous City where it's being held. If you were a student, and you knew you had signed up for an online course, and you knew that it was being held in Blackboard, and you knew how to sign in to Blackboard and had even posted comments on the discussion board, what would you say if you saw the following? An announcement on the first page that announced the WRITING ASSIGNMENT. An email from me announcing the first WRITING ASSIGNMENT. An icon, obviously clickable, that led to the week's work, which included a page called WRITING ASSIGNMENT. Lecture materials that referred on every page to the WRITING ASSIGNMENT. A menu item, visible from all pages, that said "Syllabus," which coincidentally discusses the WRITING ASSIGNMENTS for the course. A menu item that says "Lecture Materials," among which is the page for the WRITING ASSIGNMENT. Would your reaction be this? "I didn't know we had any writing assignments in this class." Two recent stories, one at The Atlantic and the other at Inside Higher Ed, raise an uncomfortable issue: what happens when the official policies of a college or university rub up against an instructor's standards? The story at Inside Higher Ed is of the professor at Norfolk State who was denied tenure for failing too many of his students. Now, there may be issues here that aren't covered in the article--issues about expectations, for example--but this part is especially pertinent: Although school policy is that students must attend 80% of class sessions, many do not and receive passing grades anyway, since "there is a clear expectation from administrators — in particular from Dean Sandra J. DeLoatch, the dean whose recommendation turned the tide against Aird’s tenure bid — that 70 percent of students should pass." No, I would adhere to academic standards, and keep myself off the front page. I'm troubled by both of these articles, so let's apply a little Lenin to the subject: what is to be done? Institute more remedial preparatory courses at the college level? But in times of cutbacks, state legislatures and students taking out loans are both disinclined to lengthen the time it takes to get a degree. Stop admitting "underprepared" students to college? This is troubling on a whole lot of levels, especially given this country's history of class, race, and gender prejudice. Hire a lot more people to work one-on-one with people like Professor X's Ms. L? See the first point: who's going to pay for this? Slide along and adapt grading standards so that the students who work hard can get the "gentlewoman's C-"? Isn't this what's happening, though, in the high schools where parents bully administrators to admit their kids into AP classes and then immediately start a campaign to water down the content since the classes are "too hard"? Decide that college isn't for everyone? Professor X suggests this, but until there's equality of income and status for those who pursue alternate career tracks, it's not likely to fly. "Watch the shoes," my colleague whispered as we settled ourselves into our seats, no small process where robes, hats, and hoods have to be adjusted lest they fall off at comical angles. She was right. At graduation, the students are, for the first time in four years, all dressed alike. In fact, they are dressed like us: we all move somewhat stiffly under the unfamiliar dignity of robes at first, marching self-consciously to "Pomp and Circumstance." It's easier for faculty to relax, because they've been to a lot of college graduations and the students haven't. Then the students stop worrying that their caps will fall off and start to relax, too. So, at the risk of sounding like a bad comparison and contrast essay, we are the same, yet different. They're wearing the regalia, varied only by the leis, stoles, and honor cords that signify their membership in various communities, and they're all there because they've achieved something important, as the smiles on their parents' faces attest. Yet (comparison and contrast transition alert!) they are all different, too, and they--at least the women--want to express this through their shoes, the only part of the wardrobe that they have a choice about showing to people. I saw a lot of fashionably high heels with very pointed toes, and even though the wearers didn't always look terribly steady in them (these were very high heels; I have a pair and can only mince along in mine), these suggested women who weren't afraid that they'd fall on their faces in front of several thousand strangers when they got their diplomas. I also saw boots, sandals, sneakers, and some well-beloved shoes that were only a step up from flip-flops. I was later told that choosing shoes is a big deal, since they know that the shoes are the only thing people can see. Yes, I listened to the speakers, heard all the songs, and was duly proud of the students I knew. Maybe it's just sentimentality (and I freely admit to being moved by ceremonies, even as I try to avoid them), but somehow I liked the idea that they were making this effort to be part of something that cost them time and money, that celebrated what they'd done, and that on the face of it emphasized how they were the same but that they'd adapted to show, even if just by their shoes, that they're all different. These are probably not news to everyone, but they are to me, so I thought I'd mention them here. Xobni (inbox spelled backwards) is an indexer for Outlook. I usually use Google Desktop to find things, but this is faster. (Also, Google Desktop will sometimes tell you that you do have a message from the person you're looking for but won't open it, tantalizing you with its vagueness.) When you click on a message in your inbox, Xobni tells you the person's phone number (if the person has ever sent it in an e-mail) as well as telling you who else is in this person's "network." This freaked me out a little at first, because I thought there was some kind of web magic involved, but it turns out that it's all based on what's in your inbox already. Highlight the chunk of text you want to have as autotext. Click on Insert, Autotext, New. Give it a name in the box that pops up. To use Autotext, Click on Insert, Autotext, Autotext, and scroll down until you find the short name that you gave it. I kept all the names to 2-5 letters for maximum speed. Alt-I-A-X and type your short name. The autotext appears in the document. Want to put this into a comment? First, insert the comment: Alt-I-M. Then Alt-I-A-X (these don't have to be capital letters) and the short name. I had never tried Autotext because of being scarred by Word macros at a tender age. To this day, one of my ancient computers has a copy of Word that, when you open it, opens Visual Basic first and demands that the macro be completed or canceled. I obviously screwed up the macro-making process badly at some point but could never get Visual Basic to stop harassing me. If I'd only known about Autotext, I'd have realized that I didn't need a macro after all and have spared myself two years of shutting down Visual Basic before I could open a document. The benefit of all this is that I am, yes, actually looking forward to the first set of assignments from the summer school class because I'll get to practice my mad Autotext skillz on them. The grades have been turned in. An old movie and a nap. Here's a hint to faculty members of all generations: do not use this phrase. No good will come of it. Example, overheard in the hall, from shiny new faculty member to a senior (in rank) one: "I don't know if someone of your generation would know this," thereby placing the senior faculty member in age as being somewhere between John McCain and Methuselah. How is the listener supposed to respond? "That's right. In my day, we didn't have theories like that. We were too busy walking uphill both ways in the snow to teach our classes." "Hadn't heard about that. I was too busy canoodling with my sheik in his Stutz Bearcat, drinking from a hip flask and reading that hot new novelist, F. Scott Fitzgerald." "Hey, kid, get off my lawn!" "We did that twenty years ago, and it didn't work then, so let's not try it again." "Technology has made all this so easy for you. You don't have to look up things the way we did." There's a fine line between departmental history and Grandpa Stories, and sometimes one crosses over into the other. I don't have any words of wisdom, except maybe this: when you're tempted to say something about "your generation" or to say something that starts "In my day," think again. It's possible to make a point without emphasizing the differences that divide us from our colleagues. 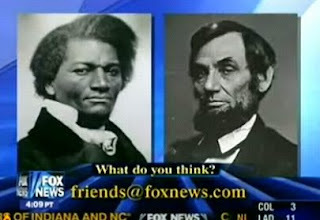 As seen at The Edge of the American West, Fox reports on a possible "Lincoln-Douglas" debate. They have entirely the wrong Douglas(s) and haven't even spelled Frederick Douglass's name correctly. Other than that, it's a swell graphic. Don't history classes in grade schools teach about the debates between the Little Giant (Stephen A. Douglas, left, from the Library of Congress) and Lincoln any more? Surely they teach about this in college courses, don't they? Or is history one of those frivolous liberal arts that are somehow dragging down the curriculum at places like the University of Toledo?